THIS WEEK ON THE HIGH SCHOOL HOLLA SPORTS SHOW, WE NOT ONLY HAVE ONE SHINING STAR BUT WE HAVE TWO “SHINING STARS”. CONGRATULATIONS TO SISTER AND BROTHER JADA & JALEN HARRIS !!! 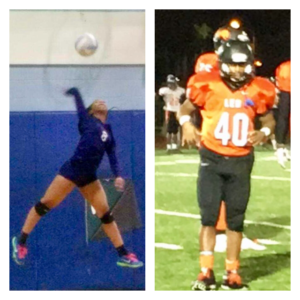 JADA REPRESENTING THE HARLAN LADY FALCONS VOLLEYBALL TEAM & JALEN REPRESENTING THE LEO LIONS FOOTBALL TEAM !!! I am so proud of both of them. Great job of parenting also goes out to Mr & Mrs. Job well done.